When you're trading CFDs, the ‘Next Generation’ platform provides a number of platform trading tools such as trader sentiment charts and pattern recognition to help you analyse the markets and identify potential trading opportunities. The ‘Next Generation’ platform provides you with Traders ' sentiment feature which shows you the percentage of traders who have bought versus the percentage who have sold on a particular product, so you can gain an understanding of other traders ' expectations. You can also see the monetary value of these positions as a percentage. You can choose to view data for ’All Traders’ with an open position in a product, or filter out the noise by switching to the 'Top Traders’ view to see data from only top traders who have made an overall profit* on their account over the last three months. The traders ' sentiment analysis data is updated every minute, meaning these valuable insights are based on almost real-time information. This is especially useful during volatile periods when market prices can change rapidly. Compare the up-to-the-minute sentiment (illustrated by the wide outer circle in the client sentiment chart above) with the figure at 10pm (UK time) the previous day (inner circle) to see recent changes in client trading. Use the 'Also being Traded' section as a source of trading ideas. It shows which other products are being traded by traders that are currently trading the product you're viewing. Available on every chart when logged in to your live account, our pattern recognition tool allows you to search for common technical chart and candle patterns, providing a price projection. 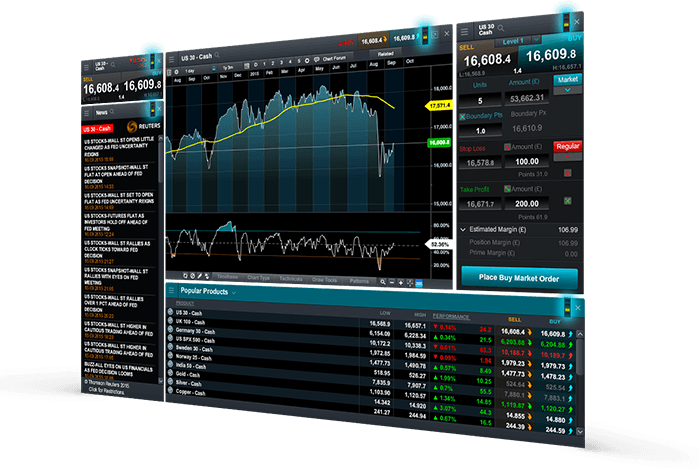 Pattern recognition scanner is another feature of the platform trading tools. 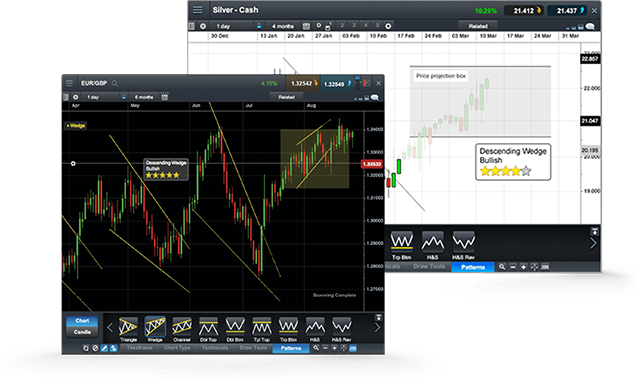 Scan over 120 of the most popular products every 15 minutes for emerging and completed chart patterns such as wedges, channels and head and shoulders formations. Set up automatic alerts so you're notified of technical trade set-ups and potential trading opportunities**. When pattern complete, a price projection box is generated using technical analysis measuring techniques to highlight where the price action could go on the instrument’s chart. Price has hit the price projection box on average 72.5% of the time across all asset classes (April-October 2016).